Though the SX-28 was announced in July 1940's QST, manufacturing didn't start until August, 1940. Most of the major dealers began advertising the SX-28 was "in stock" in September, 1940's QST. 1st RF coils have trimmers (Bands 3-6) - This was probably a schematic error although trimmers are shown on 1940 and 1941 versions. Even the earliest manual's photo of the chassis underside show that no trimmers were used on these four coils. Front panel painted blue-gray - latest SN seen with gray panel, H-125569 - earliest SN with medium black panel H-124417 (12/40) - With these kinds of changes, expect some overlapping in later or earlier serial numbers with gray or black panels due to intermixed stock. 1152 serial numbers separate latest gray panel with earliest black panel. Since SNs were not exclusive it's hard to say just how many SX-28 receivers were built until all of the gray panels were used up. So, expect either color panel to have been used 12/40 thru 1/41. Front panel texture from 1940 up to late-1943 will have shallow wrinkles or convolutions. These wrinkles were stamped into the metal panel during manufacture. 1st IF Amplifier Cathode Resistor R-16 is 300 ohms - single resistor with no switching. Upper Panel to Cabinet mounting screws (flanking main tuning dial) are being used by SN H-124230 (12/40) - Interestingly, even the earliest cabinets always did have the two tabs to accept these screws however the front panel was not drilled for these two screws until around 12/40. Red Indicator Set Points on Main Tuning Dial for correct Band Spread Dial calibration - Early dials may have had defective ink used for the red markers. Many early SX-28s will appear without red BS indicators, however close examination of the main tuning dial will usually show some traces of the original red ink. By 1941, the red ink formula was probably changed as the problem of faded red BS indicators is normally not encountered after ~ SN H-128000. Location and orientation of Auxilary Stand-by Switch outlet (looks like AC receptacle) changed when fuse holder is mounted to rear chassis - initially, located above the Phono Input jack with horizontal orientation - later moved next to fuse holder with vertical orientation. 1st IF Amplifier Cathode resistance changed to a series combination switched in on Bands 3, 4 and 5. Cathode R of 250 ohms unchanged in Bands 1, 2 and 6. Probably to compensate for gain changes due to single RF amplifier on Bands 1 and 2 and high frequency gain roll-off on Band 6. 1st IF Amplifier Cathode Resistance - values changed from 1800 ohms to 1200 ohms and 1200 ohms to 1000 ohms. These values are in series with 270 ohm (changed from 250 ohms) Cathode resistor on Bands 3, 4 and 5. Possibly changed to conform with JAN values. SX-28 Navy Versions: The rack mount, standard Navy version is from late 1943. It does not use the standard front panel but has a black wrinkle finish panel with white nomenclature. No "Super Skyrider" or "hallicrafters" on front panel - a military ID plate is mounted on the panel instead. Heavy duty construction in some areas under chassis. Cabinet is similar to AN/GRR-2. These receivers are issued standard Hallicrafters' serial numbers carried on the tag mounted to the rear chassis of the receiver. There was also the RBY-1, a Navy piece of equipment that used an SX-28 combined with a Panadaptor with 3" CRT. The SX-28 has an SO-239 installed on the back apron of the chassis to connect the Panadaptor. The version I saw also had a buffer circuit assembly on the antenna input to allow multiple receivers to use a single antenna. 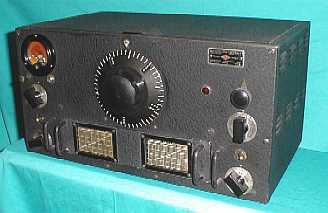 The SX-28 receiver has a military tag where the "SX-28" ID is on the front panel and it identifies the receiver as CHL-46195. The panel is black wrinkle paint - not the standard panel. This receiver did have the standard Hallicrafters serial number tag installed on the rear of the chassis with the number H-181853, indicating late 1943 production. The RBY-1 was an earlier, military version of the S-35. The introduction of the AN/GRR-2 in February 1944 became the Navy SX-28A. The "AN" designates "Army-Navy" so the AN/GRR-2 was used by both U.S.Army Signal Corps and U.S.Navy. The FCC Variations: The typical FCC receivers had a metal tag mounted on the front panel or on the back of the receiver for FCC identification. These receivers also carry the standard Hallicrafters' serial number tag with standard Hallicrafters' serial number assigned. These first production run SX-28s were first used by the FCC's RID (Radio Intelligence Division) to listen in or find enemy spy rings in the US. These SX-28s were installed in automobiles with a directional loop antenna on top of the roof. By having roving DF abilities, the RID could triangulate a signal and determine its location. Later versions were built for FCC monitoring posts where several receiving stations would be in operation. Each operator would be using earphones to prevent listening interference to an adjacent monitoring station. Since the audio requirements were minimal, the Push-Pull audio output 6V6s were usually replaced with a single-ended 6V6 audio output. The unused 6V6 tube socket mounting hole has a push-in metal plug installed. (Single 6V6 info thanks to K4ERR.) There are variations of the FCC SX-28 that may have been modified by the FCC to accomplish diversity reception or other special requirements. The FCC diversity set-ups appear to use two SX-28 receivers, one with the S-meter removed and the other with the bandspread removed. This observation is based on a photograph that appeared in CQ magazine in the 1940s. Interestingly, most FCC receivers appear to be from the first production run and will have SNs beginning with H-115xxx. George Sterling, who was head of the FCC during pre-WWII and WWII, wrote a detailed report on the RID's function and successes that included many photographs of banks of SX-28s that were in use by the FCC. Although other receivers were used, it appears the RID was almost exclusively using SX-28s for their intercept and monitoring. Canadian Versions: Distributors like Rogers-Majestic sold SX-28s in Canada. These receivers will have the original Hallicrafters' serial number tag with the standard Hallicrafters' serial number assigned and an additional serial number tag with a distributor-assigned serial number installed by the distributor in Canada. Also, the receivers usually have a tag or decal from CSA, which is similar to USA's UL. Send-Receive and Bass In/Out Switches: Short handle, ball-end toggle switches used on SN H-130170 - long handle toggles were normally used. Custom Front Panel Colors: Supposedly, white panels were needed aboard hospital ships however one has to ask - why? Silver panels turn up from time to time but these seem to be panels with the original paint stripped off. "Original" seems to have a different definition to some but claiming a panel finish as "original" doesn't mean it came from the factory that way. Custom finishes were sometimes required in certain installations, sometimes it was personal preference but almost always the end user was responsible for this operation. Though the custom panel finish may be "original" to the end user, it is not "from the factory original." 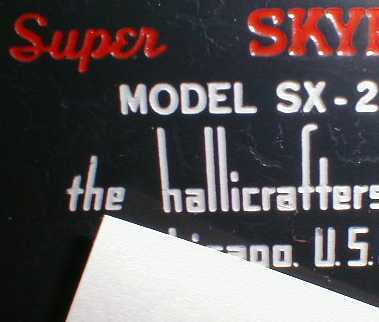 Would Hallicrafters "custom finish" an SX-28 "on request?" It would require procuring special paint that most likely wouldn't have been done for just one receiver order. Besides, the panels were made by Crowe Manufacturing for Hallicrafters and Crowe would have to do the special paint job - unlikely. It's possible that Hallicrafters might have repainted a panel for a special request but it seems like it would have been a difficult to accomplish operation since Hallicrafters production building was essentially as an assembly operation using purchased parts. White Tuning and Band Spread Dials - I recently received an e-mail photo of a restored SX-28 that had been fitted with modern reproduction "white dials." This is the only SX-28 I've ever seen with white dials installed and they were, of course, repro dials. Were white dials ever installed on the SX-28? On standard production receivers the answer is no. IF any WWII-vintage white dials are authentically installed on a WWII vintage SX-28, they are an anomaly that could probably be attributed to the end-user installing non-OEM parts. Who would have made these dials? The Signal Corps? An unlikely scenario that would then account for the absence of any confirmed vintage examples. SX-32 & S-35, though they aren't really variations, the SX-32 is very similar to the SX-28 but doesn't have the Lamb Noise Silencer or Bass Boost and uses 13 tubes. It was priced at $149.50. The SX-32 was introduced in July 1941 and, by September, the SX-28's price was increased from $159.50 to $179.50. The S-35 was advertised as a "panoramic receiver" and was an SX-28A with a panoramic adaptor with 5" CRT mounted in a single, tall table cabinet. The 1946 price of $375 probably kept most S-35s out of the amateur's shack. MANUALS: If you don't have a manual, get one. Remember, there are several variations in the manuals with different schematics and different under chassis layouts (for alignment.) The earliest manual was printed on "slick" paper in August of 1940 and is numbered "07292840." This manual has the earliest schematic with the two 6SK7 RF amplifiers. The next version is from August of 1941 and is printed on standard matte paper. 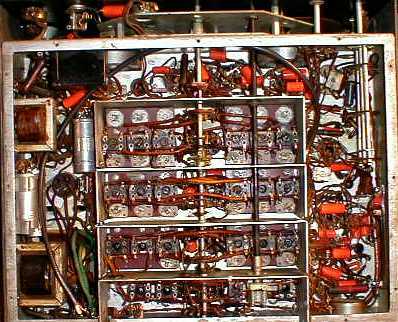 It is numbered "01092841" and has most of the 1941 changes shown on the schematic and in the circuit descriptions. The schematic and alignment information in Rider's Perpetual Troubleshooting Manual VOL. XII is the same as "01092841" Hallicrafters' manual. Most reproduction manuals that are available are broken down into "standard" early version (01092841), mid-production version (no number-1942) and SX-28A (April 10, 1944.) Most production SX-28s won't agree entirely with any manual as the engineering changes were incorporated immediately while documentation usually took some time. Sometimes addemdums turn-up, so Hallicrafters was attempting to keep their documentation current. The mid-production manuals are sometimes dated "1943" but many manuals at this time weren't dated at all. Many of the 1943 manuals have thick covers rather than standard paper (more variations!) If the schematic shows the AVC and ANT TRIM changes, then it is a mid-production manual from August, 1942 (or later.) The SX-28A manuals are so-marked and Rider's VOL. XVI contains a schematic and alignment information on the SX-28A. There is also an AN/GRR-2 (military SX-28A) manual that has much more detail than its civilian counterparts. The AN/GRR-2 manual is TM-11-874. There is an error in the GRR-2 schematic in TM-11-874...R17 (1K) and its connection to pins 4 and 5 of the 6L7 first IF amplifier are missing. This part of the circuit is shown correctly in the standard SX-28A manual's schematic. WORKMANSHIP: The SX-28 or the SX-28A are not easy receivers to restore. There are around forty paper-wax capacitors to replace along with five electrolytics. Many of the capacitors are difficult to access and several parts need to be dismounted or disassembled to remove old capacitors and install the new capacitors. Additionally, many of the resistors can't be measured accurately while in the circuit. This requires that one end be unsoldered for accurate measurement if the resistor is suspect. How well the receiver is going to work after its rebuild depends on the level of workmanship (or skill) of the rebuilder. Checking yourself and rechecking what you are doing is second nature to experienced technicians. Quality soldering technique again is something acquired with experience. Real SnPb solder must be used for quality work. Rushing through the job is not recommended as this leads to mistakes and poor workmanship. All of these are important skills that are necessary when reworking (or considering reworking) any receiver as challenging as the SX-28 or SX-28A. ELECTRONICS - CAPACITORS: For best reliability, all paper-wax capacitors and all electrolytic capacitors should be replaced. From the manual, go through the parts list and order the capacitors in advance. Having them all on-hand makes the job much easier. Whether you use "orange-drops" or "yellow jackets" is up to you. Both types are excellent quality caps that are much better than the originals were when they were new. I find it easier to work a section at a time starting at the power supply then moving to the IF/ANL side and then to the front part with AVC/DET and BFO circuits. Also, I install the electrolytics inside the original cans. This is just for aesthetic reasons and results in a nicer looking job. I usually don't re-stuff the paper-wax capacitors in SX-28s or 28As because there are plenty of original examples of these receivers around so preserving the original appearance of the under side of the chassis is not as important as it is with other, more scarce equipment. However, a purist would go ahead and restuff the paper caps to preserve to original under-chassis appearance. If resistors need to be replaced, the purist would use vintage originals that haven't drifted in value. Any other defective components would be replaced with good condition original parts. This makes a restoration difficult and very time consuming but the end results are stunning. As time goes on, and more and more SX-28s are restored with new parts, it will become more important to preserve the authentic appearance of the underneath of the SX-28 chassis. So, why not start now? RF BOX CAPACITOR REPLACEMENT - SX-28: There are usually eleven capacitors that should be changed in the RF box. Though some people can work around with special tools to replace the caps without disassembly, I can't imagine hocomplish it without breaking something. Disassembly of the RF box is necessary, along with removal of both RF coil chassis. This will require desoldering several connections to the tuning and bandspread condensers, desoldering wires from the coil chassis to connections in the receiver chassis and a few wires that interconnect between the coil chassis. Usually the Mixer coil chassis can be worked on while still in place, however a long tip soldering iron will be required to reach the chassis connection on one of the capacitors on earlier versions. Read the procedure on restoring an SX-28, in particular the section on rebuilding the RF box, at Phil's Old Radios (link provided in references, bottom of page.) This is a step-by-step guide that can be followed as you rework the RF box. Remember, this is a guide - not all SX-28s are exactly like the one described in that procedure. Watch the height of the caps when mounting the replacements as clearance is tight. I use a Makita driver to disassemble the RF box - it's a lot faster and the bits seem to fit the Phillips head screws better. The early SX-28s used hex head screws to mount the coil chassis. These make clearance between the coils and dividers very tight so care has to be taken to avoid damaging the coils. A straight sided, .25" hex, driver bit extension can be used as a nut driver for extra clearance. 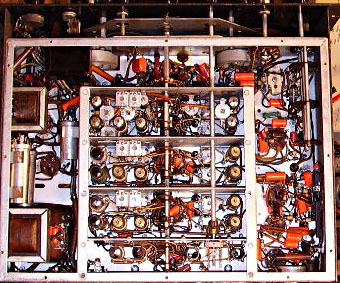 Photo right of the underside of SX-28 SN H-119051 showing the construction of the RF box and the layout of the various coils and trimmers. 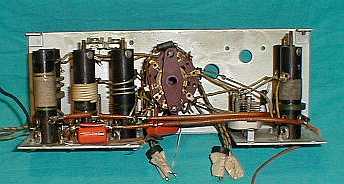 There are several noticeable differences in this early model, e.g., the chassis mounted RF Gain control, the absence of the shielded cables for the ANL switch, air trimmers used in the 2nd RF and Mixer coil assemblies. Also, noticeable are the SBE Orange Drop replacement capacitors. photo left: A close-up of the 2nd RF coil assembly from an SX-28 removed for rebuilding. Shown are the large coils that are characteristic for that model. Since this is an early version, note the air capacitor trimmers. photo right: This is a close-up of the 2nd RF coil assembly from an SX-28A removed for rebuilding. Note the difference in the size and shape of the Hi-Q Micro-set coils compared to the old style coils of the SX-28. Shown are the fiber boards that the coils mount to and the tube socket that is part of the coil assembly. Though they can't be seen in the photo, the condenser leads are underneath the assembly. ALIGNMENT: Though re-capping is certainly an important facet of the electronic rebuild, a thorough alignment is what really allows the rebuilt SX-28 to perform to its full capabilities. The manual's alignment instructions are tedious and never changed (after 1941) throughout the SX-28 and SX-28A production. Even TM-11-874 for the AN/GRR-2 uses the same procedure. Essentially, the procedure tells you to "rough" align the IF at 455KC and then determine the exact crystal frequency. Realign the IF at this frequency and balance the crystal filter response for its three positions using the trimmers provided. If you have aligned communications receivers before, the procedure will be a familiar process. A resistive load is required for alignment of the 1941 Lamb Noise Silencer (the earlier version does not require a load for alignment.) The manual references the color of the wires for placement of the load but unfortunately most SX-28 wiring has darken considerably and it is difficult to tell where the load is placed except by referencing the schematic. The remainder of the alignment is standard procedure. The better your alignment skills are and the better your equipment is, the better your SX-28 will perform after alignment. Sometimes the slugs on the Hi-Q Micro-set coils used on the SX-28A are waxed in place making adjustment difficult. Normally, the slugs will show excessive wear in the slot for the adjustment tool. You have to proceed carefully if adjustment is necessary as the slugs break easily. Sometimes it will be impossible to move a stuck slug without breaking it or breaking the coil mounting, which is not an option. Try a small amount of localized heat (small soldering iron tip on slug) to loosen a stuck slug. After about 10 seconds you should see the wax begin to bubble near the edge of the slug. Alternately, keep trying to move the slug and then apply the heat. Eventually, the slug should loosen. If the slug is hopelessly stuck, try to equalize the error across the band using the trimmer adjustment. S-METER POT: A common problem with SX-28s is the S-meter potentiometer. Quite a few will show a short to chassis. In most cases these are easy to repair. Remove the pot from the circuit and the chassis. Remove the rear cover from the pot. This is a tight press-fit but if you support the pot body in a small vise, the rear cover can be removed by using a small flat metal drift and a small hammer. Don't be too aggressive, the cover will come off with gentle taps. Once the rear cover is off, you will probably find that the rear cover's inside metal plating has peeled off and several strands of metal plating are all around the windings of the pot. These can be blown out with air or brushed out with a small paint brush. Once the strands are removed the pot will no longer show a short to case (or chassis.) Reinstall the rear cover (after wire brushing the remaining plating off of the inside of the cover) and reinstall the pot into the circuit and chassis. AUDIO OUTPUT TRANSFORMER: The audio output transformer used in the SX-28 and SX-28A was unique to Hallicrafters' designs. It is 9K Z CT on the plate side and 100, 500 and 5000 ohms Z on the output side. Nowadays, quite a few SX-28s are missing their original audio transformer and a universal replacement has been installed in its place. The replacement will not have the correct output Z and will compromise the correct operation of original Hallicrafters' speakers that have the 5000 to 8 ohm Z matching transformer built-in. Try to find a functional original but in the meantime, the Peter W. Dahl Co. , now a subsidiary of Harbach Electronics LLC, does make a correct replacement audio transformer for the SX-28 (Peter Dahl-Harbach website listed below in references.) Its installation will provide the correct matching Z for the P-P 6V6 amplifiers and allow the SX-28 to be used with an original Hallicrafters' speaker, such as the PM-23 or R-12. The physical size and construction is identical to the original, however the appearance is somewhat different in that Dahl's transformer is painted black. In operation, it provides excellent audio that is identical to the original transformer. NOTE: Check the Internet for current availability and sources. Harbach has sold some of the transformer business in 2013. If ever there is a subject that will produce endless controversy, it will be "what is correct" or "what was original" for the paint color, nomenclature, dials, etc.,...and this is for just about any object that is in need of cosmetic restoration. Of course, I advocate that, whenever possible, only cleaning of the original finishes should be performed. This preserves the originality for future reference. However, sometimes the cosmetics are in such terrible condition a restoration is required for an acceptable appearance. What is presented here is a guide for doing an authentic cosmetic restoration of the SX-28 that conforms to how the receiver appeared when it originally left the Hallicrafters' plant. >>> If you have cabinet paint that is beyond saving, there are automotive paint shops that specialize in various types of powder coating that can sometimes give good results (but often they don't.) Sometimes their paint jobs can look fairly close to wrinkle finish (at least at a distance.) All of the powder coated SX-28 cabinets I've seen have been painted black, which is incorrect. The one gray wrinkle powder coat job I saw was on a PM-23 speaker cabinet and the color was more blue than it was gray leading me to believe the painter was either careless or color-blind. Definitely have the powder coater provide some samples of his work before having him paint your cabinet. They can do good work but often their schedules have them hurrying through jobs that should require attention to details. USE ALL OF THE SCREWS - When reinstalling the receiver chassis into the cabinet, be sure to install all of the screws that secure the chassis to the bottom of the cabinet. If the screws are left out (which is how many unrestored SX-28s are found) overall stability of the receiver suffers. This is a mechanical issue and without the screws any movement of the cabinet results in flexing of the chassis. When all of the screws are installed and tight, the SX-28 chassis is rigidly mounted and the cabinet can be "jarred" with very little (if any) frequency change resulting. FRONT PANEL: The front panels are "dark" gray-blue on very early SX-28s. This same color was used on many Hallicrafters' cabinets, like the S-20R. The front panel color was changed to a "charcoal" black in December 1940 and remained that color until late 1943 when the new, heavily textured front panel was introduced on some of the last SX-28s produced. There is some evidence that the front panel paint color was changed sometime before the heavy textured panel introduction as at least a couple of SX-28s have turned-up with the bluish-gray-black paint on front panels with the light texture (SNs H-161034 and H-173684.) This same color was also found on a 1944 AN/GRR-2 receiver panel. In comparisons with other, later SX-28A receiver panels, it does appear to be a slightly different color, however more examples of later, post-war SX-28As have to be examined to determine if this color was used after the end of WWII. Usually, the late-1945 to 1946 SX-28A front panels are sort of a gunmetal-type blue-black. The color difference between the WWII panels and post-WWII panels is subtle and really only noticeable when compared directly with other panels. When a poor condition panel is encountered and it is necessary to repaint, a good condition original panel is always helpful for comparison to available colors for matching. In most cases the back of the panel will provide the best condition source for the correct color match. NOTE: I cannot stress the following point enough when restoring SX-28/28A front panels. The nomenclature on the panel is NOT white but is correctly MATTE SILVER. Careful examination of a good condition, clean, original panel will show that the fill color is definitely matte-silver. Over the years, the silver fill paint will have discolored with smoke and other "grunge" so that it might look "smoky-white" but - look closely - it is actually silver. Many "hamster-restorers" just don't care whether the panel is correct - as long as it's new paint. The front panels were never jet black with white nomenclature. For authentic restoration of the SX-28/28A the front panel color should be determined by inspection of the back side of the panel and the paint color matched accordingly. Nomenclature is matte-silver with the exception of "Super SKYRIDER" which is filled with dark red (not fire engine red) paint. photo above: A close-up showing the matte silver paint fill used for the nomenclature of an excellent condition original SX-28. A white card was placed in the photo as a reference (although most monitors have a difficult time reproducing silver colors.) Note the red is a very dark shade. DIAL CLEANING: Never let excessive moisture get on the front of either of the dials or the meter scale. The ink used is somewhat water soluble and if aggressive wet-cleaning is attempted it will be the end of the dial nomenclature. Never use "Windex" or similar ammonia-based glass cleaners on the nomenclature side of the dial. These types of cleaners dissolve the ink almost immediately. If the dials are in good condition, use only a dry camel hair brush to dust off the surface - lightly. The back of the dials and the meter scale can be wet-cleaned and it will help the overall brightness when illuminated. If the dials are severely discolored due to smoke and dirt, their appearance may be improved using a "foaming" plastic cleaner. These plastic cleaners contain very little water and no ammonia. I have had some success using this type of cleaner applied with a cotton cloth (never use paper towels on plastic.) The cloth should be sprayed, not the dial. With the cloth slightly damp, apply the cleaner gently. This has to be performed with a light touch while watching the dial nomenclature for any thinning. Avoid the red BS indicators. You will only be able to remove some of the oxidation - don't be too aggressive or you will begin to remove the dial nomenclature. Careful cleaning will help "even-out" the discoloration due to dirt and smoke. This method will also help somewhat with the discoloration due to exposure to light. The photosensitive color change is actually into the plastic and it is impossible to return the dial to its original color. Most of the dials have darkened considerably over the years and aggressive cleaning will surely damage the dial nomenclature. It is unfortunate but that was the type of plastics that were around in 1940. The correct dial color is light yellow but most are now a dark orange-amber. Since the dials were photosensitive, you probably will find that the part of the dial that was exposed to light through the dial glass will be much darker than the unexposed sections. Also, the main dial has red markers for setting the main dial for bandspread use. The early SX-28s had a problem with the red ink used that results in the indicators fading to the point of invisibility. Even the later formula red ink is super-sensitive to light, wet, rubbing - just about anything. Leave the red markers alone. THE DIAL CHANGING COLOR CONTROVERSY AND THE "WHITE DIAL" MYTH: Shown to the right are some sample dials. The uppermost photo shows an excellent original dial with no darkening. This is about as close as can be found today of the original dial color, which was "light yellow." The next dial down shows how most dials look today, substantially darker due to exposure to light and some deposits from tobacco smoke and other contaminates. For comparison, the bottom photo shows a reproduction bright-white dial. Although there are some restorers that believe that white plastic was original to the SX-28, this is an erroneous assumption based on the "White Dial" myth. The next "White Dial" myth is that Hallicrafters supplied white dials on some SX-28s during WWII. This is highly unlikely and so far all evidence produced to support the use of "white dials" has been hearsay. If genuine WWII-vintage white dials for the SX-28 existed they were an anomaly that could have been the result of OEM parts shortages causing the military to use non-OEM parts during an echelon rebuild of an SX-28. An unlikely scenario. Who would have made the white non-OEM dials? The Signal Corps? The known evidence - an apparent absence of any authentic examples - leads one to conclude that the use of WWII vintage white dials on an SX-28 is a myth. This photo shows a non-authentic reproduction dial. The production SX-28 never used white dials, despite what you may read elsewhere. The SX-28 is a great receiver - but it was designed in 1940 and, as such, its performance is dated when compared to a modern receiver's performance. In its day the SX-28 was the "top of the line" from Hallicrafters and, as a new SX-28 owner, you should want to experience what the original owners enjoyed about the receiver's performance - something accomplished with a good rebuild and alignment - not modifications. Granted that modern signals, like SSB, weren't part of that original owner's experience but the SX-28 is perfectly capable of receiving SSB signals without modifications. Of course the SX-28 drifts,...and you have to "ride" the RF Gain because you can't have the AVC on with the BFO,...and the dial accuracy is vague - all pre-WWII receivers have the same performance characteristics - it's part of the nostalgia that vintage equipment owners want to experience. Modifying a vintage classic receiver in an effort to "modernize" its design seems to go against the very idea of preserving and operating vintage equipment in the first place. Here is a list of some of the common mods you might encounter - and have to remove - in the SX-28 or SX-28A receivers. Hallicrafters joined in on the "modification mania" of the fifties and issued an upgrade to the Lamb Noise Silencer in August 1951. Titled as "Service Bulletin from Hallicrafters - Bulletin 1951-30," it consists of four pages printed on two sheets of yellow paper. The first mod removed the 6H6 rectifier from the Lamb Noise Silencer and replaced it with a 6AL5 dual diode (but only one section was used.) The 6AL5 is supposed to be mounted on a bracket under the chassis close to the detector tube. The rectifier is reconfigured to operate in series rather than the original shunt arrangement. The bulletin continues that since you have removed the 6H6 ANL Rectifier tube, now you can use that tube socket to add a 6SL7 cathode follower for a panoramic adapter or oscilloscope - however, the connections are to the last IF amplifier stage where the IF selectivity will severely limit the bandwidth of a panoramic adapter display (use the link below to read about the correct method of connecting a Panadapter to the SX-28.) Additionally, the mod has you use the other section of the 6SL7 as a 100KC crystal oscillator for calibration. The bulletin concludes with the statement that if the rework is beyond your capabilities, a Hallicrafters Service Center will perform the job and also perform a thorough "overhaul" of your receiver. I have owned one SX-28 that had just the ANL mod installed and it is doubtful that the "modifier" was happy with the results. The Lamb Noise Silencer was a great circuit and it was the only pre-war tuned noise blanker used in any receiver (it was also available in the RME-69LS-1 receiver.) It was the only ANL circuit of the time that worked in CW and AM. As for the Panadapter and Crystal Oscillator mods - they are of dubious value. >>> NOTE: I recently (2008) was shown a photo of an SX-28A HA-53212 that had the Hallicrafters' mods installed by a Hallicrafters dealer. The front panel indicators for the mod installation by Hallicrafters are the addition of a toggle switch installed next to the BASS switch and another toggle switch installed next to the SEND-RECEIVE switch. There isn't any nomenclature for the switch functions but their installation appears to match the rest of the receiver's appearance. Over the past few years, several questions about the detector load and audio distortion while using AVC have been poised and this has resulted in a couple of mods being published to reduce "perceived" audio distortion. These are usually minor modifications involving resistor changes and improvements are certainly subjective. The SX-28's 1940 design selected the diode load resistor value as a balance between best sensitivity with the least audio distortion. As is the case with most amateur modifications, enhancing one aspect of performance (audio) will subtract from another (sensitivity.) Remember that when the Hallicrafters' engineers designed the SX-28 it was as a communications receiver first and to have great audio fidelity second. Be sure that the receiver you are judging has been completely rebuilt and aligned before making a hasty decision regarding its audio quality. An ubiquitous mod is the 6AC7 sub for the 6AB7 in the 1st RF stage. This is a "plug-in" modification with no alignment issues and at least it does no harm to the receiver. The theory is that the 6AC7 has a greater transconductance figure than the 6AB7 and should therefore result in more sensitivity. Then why didn't Hallicrafters install the 6AC7 in the first place? It was possible that a 6AC7 RF stage could oscillate under certain conditions which weren't entirely predictable by Hallicrafters. Also, the receiver could be more susceptible to cross-modulation with the 6AC7 as the first RF amp. Also, one of the last engineering upgrades to the SX-28A was to change the 2nd RF amplifier tube to a 6AB7! Obviously, Hallicrafters' engineers believed the 6AB7 was giving the SX-28A maximum usable sensitivity. I have operated SX-28s with the 6AC7 1st RF amp and with the original 6AB7 for long periods of time and noticed very little difference. My H-119051 receiver is running the 6AB7 and I notice very little difference in sensitivity when compared to H-130170 which has the 6AC7 installed. My AN/GRR-2 receiver HA-2703 is also running the 6AB7 as the 1st RF amplifier with excellent sensitivity. All three receivers have been completely rebuilt and aligned. Many SX-28s and SX-28As encountered will already have the 6AC7 installed as it was a very popular mod that was probably installed after the receiver had aged several years and really would have benefited from a new set of tubes and a full alignment instead. On the subject of tubes, be sure that all of the tubes used in your SX-28 test "as new," especially the 6SA7, 6B8 and 6SK7 tubes. Overall performance suffers noticeably with marginal tubes. SX-28 vs SX-28A: Most Hallicrafters enthusiasts have various opinions about the merits of either receiver. A commonly heard statement is that the "...pre-war SX-28 is better than the SX-28A." In some regards this is true. Throughout production, Hallicrafters was cutting costs (normal business procedure) by using less expensive parts and construction. For example, the gear-driven bandspread on the early SX-28 (and AN/GRR-2) has a better feel and a better ratio than the dial-cord drive used on the late SX-28 and SX-28As. Other SX-28 cost cutters were the elimination of air trimmers in the front end and last IF transformer. On the down-side, the very early SX-28s have a slightly less effective version of the Lamb Noise Silencer and an Antenna Trim that only functions on the top four bands. Certainly the SX-28s seem to align better than SX-28As. The Hi-Q Micro-Set coils used in the SX-28A were another cost cutting and material conservation measure requiring no brass parts in construction and a time savings on the alignment, maintenance and rework. Nowadays they are always a source of problems because of slugs that are broken, missing, stuck or so loose they won't hold alignment. Military SX-28s, which are most of the receivers made between 1942 and 1945, sometimes have significant mis-adjustment in the tuning gears. Additionally, the military examples are usually fungicide treated which makes any rework (soldering) difficult. When it comes to performance though, the differences between a rebuilt SX-28 and a rebuilt SX-28A are subtle. You will probably find that the SX-28 will have a more accurate dial readout but both receivers have strong, bassy audio with good sensitivity and stability. >>> Since the SX-28 is using a standard envelope detector with the minimal BFO injection accomplished by a "gimmick", one has to "ride" the RF GAIN since the AVC cannot be used. This was standard for all communications receivers up to the time when product detectors came along in the mid-fifties. Typically, the RF GAIN will be set around "5" or less and the AF GAIN set to "5" or more. If an SSB signal sounds distorted, the RF GAIN is too high. Keeping the RF Gain low will provide the detector with the proper ratio of signal to BFO injection for good SSB demodulation. The CRYSTAL FILTER can be used for increased selectivity, for heterodyne rejection or for "peaking" a particular audio frequency when copying CW. The CRYSTAL FILTER is actually quite effective in the AM mode also. You have to adjust the PHASING for minimum bandwidth and then tune the AM signal "on the nose." It's really very effective for reducing adjacent frequency interference. The Lamb Noise Silencer is a "tuned noise blanker" that must be aligned to the 455kc IF to operate correctly. It is an excellent noise limiter when functioning and is the only noise limiter circuit from pre-WWII that actually works for CW. It is normal for the ANL control to be in the 6 to 8 range before noise reduction is apparent. The top band covers 20-43MC and this is where most of the problems in tracking and lack of sensitivity or stability are encountered. The SX-28 performs no worse than any other 1940 receiver at those frequencies. One should remember that the design of the SX-28 is over 65 years old but in its day, its performance was equal to or (in some cases) better than the competition's receivers. It can't compare to the performance of a modern ICOM, Yaesu or Kenwood. Sixty years of receiver design and electronic evolution have taken place since the SX-28 was new. It is fair, though, to compare the SX-28 to its 1940 contemporaries. The National HRO Senior was the top receiver from National from early 1935 up to the last tube-type variant of the mid-1950s, the HRO-60. The HRO Sr. is an excellent CW receiver with great sensitivity, low-front-end noise and incredible bandspread. The HRO Sr. also provides double pre-selection on all coil assemblies, so two RF amplifiers are used at all times. A separate power supply is required and the HRO lacks a powerful audio section utilizing only a single-ended 42 (or 2A5 on early models.) It has great a crystal filter for selectivity, which works wonders on either AM or CW, however few amateurs ever used it enough to appreciate it. No Noise Limiter was used in the HRO until the post-war HRO-5TA1 was introduced. No Antenna Trim is provided on the HRO so the 1st RF Amp stage on each coil has to be aligned to the station antenna used on that band. The Sperry Gyroscope based Micrometer dial is fabulous but provides no direct calibration leaving the operator to check the dial readout versus a graph. 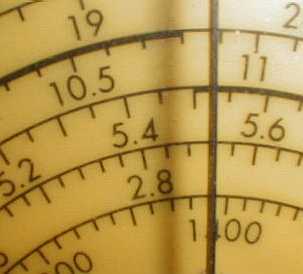 Resetability of the dial to a known logged frequency is precise, however the dial is not illuminated. The Plug-in coil assemblies were part of what gave the HRO its low-noise figure but they are a hassle to store when not in use and changing bands is a pain. Also, when changing coil assemblies from general coverage to bandspread, four small screws have to be removed and screwed in different holes. No doubt, National figured that the hams would leave the coils set for bandspread. The HRO was always promoted in QST, with every issue featuring photos of ham stations showing the HRO center-stage, perhaps giving a somewhat biased perspective of just how popular the HRO was. After all, it was expensive, required several accessories (like Power Supply, Coils, Speaker) and lacked easy versatility. On the positive side, the ham bandspread is the best that can be found on a vintage receiver and the sensitivity unbeatable. If you are interested in working CW-DX, the HRO Sr. is a fabulous choice. The Hammarlund Super-Pro was an expensive receiver designed for professional use and by the time the company introduced the 200 Series, in October 1939, the price had been reduced and several features enhanced or added. If a ham could afford a National HRO with all the accessories, he could probably afford a Super-Pro. Like the HRO, the Super-Pro uses a separate power supply and speaker. A special design cam-operated band switch, special tuning and bandspread condensers and twenty lab-tuned coils on Isolantite bases make up the front-end of the receiver. Double preselection is used on all bands regardless of model or variation. The front-end of a Super-Pro is a magnificent construction effort and it is testament to its quality that 65 years later very few Super-Pros ever have problems with their front-ends. This superior quality effort resulted in dial readout accuracy of 0.5% and even today an aligned Super-Pro will still meet or exceed that spec. Another special design was the variable-coupled IF section that gave continuously adjustable bandwidth from 16kc down to 3kc. This is great for AM stations whether BC or ham. Additionally, a crystal filter gave heterodyne relief and increased selectivity. Finally, the audio section is powerful with a triode-connected 6F6 driving a push-pull pair of triode-connected 6F6s giving about 14 watts of high fidelity audio. Since there is no tone control on the 200 Series Super-Pro (other than cutting the highs by reducing bandwidth,) the better the speaker quality is, the better the audio will sound. So, with all of these great features, why is the Super-Pro seldom encountered on the AM ham bands today? First, the frequency coverage is somewhat limited. Only the SP-200SX covers all of the HF ham bands (1.25-40MC) but it is the rarest of the variants. The next best is the standard SP-200X, covering .54-20MC. One has to remember, in 1940, most hams were on 160M to 20M, so the SP-200X satisfied the majority of the ham's frequency requirements. The BC-779 (SP-200LX) has two LW bands, 100-200KC and 200-400KC and covers 2.5 -20MC on the top three bands. It is a more specialized commercial-military communications receiver in that it doesn't tune the AMBC band or 160M. Next is the bandspread which is only calibrated in a 0-100 scale and only operates on the top three bands. The SX variation does provide bandspread on all five bands however due to the way this is accomplished some of the ham bands are covered with only about 50% of the bandspread range. The SP-200X version had the bandspread condenser designed so that all ham bands were covered with about 90% of the bandspread range. Finally, the Super-Pro can have a tendency to be noisy in the front-end when used with certain kinds of antennas. It does take a very long time to stabilize but, as a commercial/military receiver, it was designed to be left on continuously therefore eliminating the drifting issue. The Hammarlund Super-Pro was never very popular in ham shacks due to its high selling price but today its great audio and continuously variable IF bandwidth make it ideal for vintage AM operation. The Hallicrafters SX-28 has a lot going for it when compared to these two "flagship" competitors. Bandswitching frequency coverage is greater than any of the Super-Pro variations and would require optional coils to equal with the HRO. The SX-28 has a built-in power supply - both the HRO and the Super-Pro use separate a power supply. 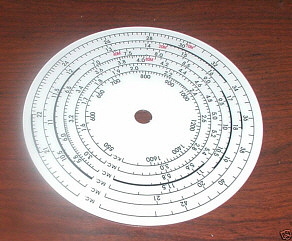 Direct readout calibration on the main tuning dial and the bandspread dial is used on the SX-28 - the Super-Pro's bandspread dial is 0-100 and the HRO requires micrometer vs graph to determine frequency. Switch selectable IF bandwidth with Crystal Filter - although the Super-Pro's continuously variable IF bandwidth is better, the HRO has just the Crystal Filter. High Fidelity audio - so does the Super-Pro along with more audio power (14 watts vs the SX-28's 8 watts.) Tone control - although one can reduce high frequency audio by limiting the bandwidth on the Super-Pro, the HRO has no tone control. Antenna Trim control - neither the HRO or the Super-Pro provide antenna compensation requiring the 1st RF Amp on each coil assembly or band to be aligned to the station antenna for best performance. The SX-28 has a tuned ANL designed by James Lamb - the Super-Pro has a clipper type ANL but the HRO has no noise limiter until after WWII. Amplified AVC - so does the Super-Pro, the HRO has standard AVC. Now what about the SX-28 disadvantages. The SX-28 only uses double preselection on the top four bands, this leaves the AMBC and 1.6-3.0MC range only using one RF amp. Hallicrafters only used two RF amplifiers for the increased image rejection necessary on higher frequencies. Double preselection is used on all bands on both the Super-Pro and the HRO, perhaps unnecessary but AM BC performance on the Super Pro is phenomenal. SX-28's dial accuracy is pretty good if aligned correctly - but it doesn't compare to the Super-Pro's better than 0.5% dial accuracy, however there's no contest when compared to the HRO which requires graphs and micrometer readouts. Hallicrafters' speakers require 5000 ohm Z audio, which the SX-28 provides, but if you want to use some other speaker you would probably opt for the 500 ohm Z output with a matching transformer. The Super-Pro is usually 600 ohm Z and the HRO is 7000 ohm Z requiring an audio output transformer (usually mounted on the speaker frame in National speakers) so there's no real advantage to any of these receivers when trying to match a standard 8 ohm Z speaker. Then there were the original selling prices. SX-28s sold for $159.50 without the speaker in 1940 (PM-23 was $12.) In September 1941, the price increased to $179.50 with the PM-23 speaker then selling for $15.00. Though the list prices were much higher, a Hammarlund Super-Pro 200 could be purchased from most dealers for $275.00 with power supply and speaker included. The basic HRO sold for around $195.00 which included four coils sets but did not include the power supply or speaker. These necessary accessories would push the total HRO package price up to about $225.00. These are generally pre-war prices and, after WWII, everyone raised their prices. The SX-28 was a bargain and provided the most features with the least amount of accessories and added expense. 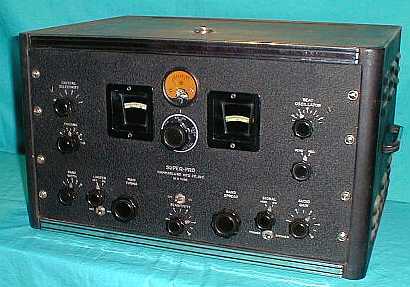 Without doubt, selling price was the primary factor in most ham's decision to purchase an SX-28 for their station receiver. The SX-28 performance was certainly competitive with the HRO or the Super-Pro but it was clearly not superior. A low selling price for the high level of performance was the SX-28's major advantage. Today's SX-28 Selling Prices - Prices nowadays are skewed due to the popularity of all Hallicrafters and, in particular, the SX-28 and SX-28A. A GOOD condition and COMPLETE but UNRESTORED SX-28 will usually sell in the $250+ range. If it has been completely rebuilt, the price will be astounding, with excellent examples having sold for $1000+ in this condition. There are exceptions for exceptional receivers and some SX-28s have sky-rocketed over $2500 - but these are exceptions. All of these exorbitant prices are found on eBay sales. Ham swap meet prices are at least half of eBay and often much less than that. However, incomplete condition and "hamster restorations" are common with swap meet equipment. Quality, professional-level restorations seldom sell at ham swap meets so that type of receiver is going to be found on eBay. The Super Pro - demand for the Super-Pro is difficult to predict as there are many variations that are more desirable than others. The early Super-Pros, like the SP-10 and SP-100s are very rare and consequently, very expensive. The SP-200 Series was produced in large quantities although many of the surviving examples are in poor condition. A GREAT condition, COMPLETE SP-200SX, with 160M through 10M coverage, may sell for well over $500 (when's the last time you've seen the SP-200SX version for sale?) The SP-200X will depend on condition, whether it is civilian or military and the paint type used on the front panel. The SP-200X usually will not sell for much more than $250. Since the BC-779 (SP-200LX) is a specialized communications receiver with LW coverage it sometimes sells for much less than the other model Super-Pros. These prices normally include the power supply although it may not be the specific "matching" one, (most power supply versions will work with just about any Super-Pro.) Any Super Pro without its power supply and cable is "incomplete" and should be priced as a "parts set." The National HRO - is also dependent on the particular version with early examples (pre-1936) selling for very high prices due to collector interest. First production run versions are rare (< 100 units) and are seldom for sale with "trading" usually required for acquisition. The typical 1936-1941 HRO Sr., in good condition with power supply and four original (matching SN) coils will usually sell in the $400 range. As with the Super Pro, if the HRO is without its power supply or coils, it's a "parts set" and should be priced as such. There does seem to be a trend for all good condition and complete pre-WWII receivers selling well above $250 and often up to $450+ depending on demand and rarity. These prices assume that the buyer will be shopping on eBay and can't go to ham swap meets where the prices are about half (or less) of "eBay." Some hams are reluctant to use a pre-war receiver in actual "on-the-air" operations fearing that adjacent frequency QRM will limit their ability to successfully copy stations and that they will be unable to complete QSOs or Vintage Net operations. However, the SX-28 (and almost all other high-end, vintage communication receivers) included a couple of "QRM fighting" devices that seem to be rarely used by AM ham operators. The easiest device to use is the SX-28's own passband selectivity that is controlled by the Selectivity control. When there's a lot of band activity, you almost always have to switch to SHARP IF. All-to-often, this isn't enough for very near-frequency QRM,...especially if you're in the AM mode and the QRM is from a SSB signal. However, while in SHARP IF, try tuning "off frequency" a couple of kilocycles from your frequency of operation. You can usually greatly reduce interference and still recover enough audio for decent copy of the AM signal. Usually two or three kc, either above or below the operating frequency, will drop the QRM enough for good copy. The SSB operators will always have filters in their rigs to limit their bandwidth to about 2.1kc. A typical AM signal has about 6kc of bandwidth. Also, the typical AM envelope has the audio information in both sidebands. 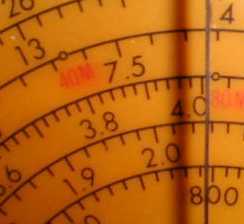 >>> >>> By tuning above or below your operating frequency, you will be able to receive one AM sideband and usually "drop" the offending SSB signal out of the receiver's passband. This is the method I use most often to "dodge" SSB QRM and it really works quite well on almost any vintage receiver. 1. Any SX-28 with a serial number higher than H-180,000 or any SX-28 with "HA" prefix serial number - we are interested in the type and color of front panel used, the type of condenser box cover installed, the type of tuning and bandspread knobs used and any other late changes noted. 2. Any SX-28A (or AN/GRR-2) with a four digit serial number earlier than HA-2500 - Indicates when SX-28A production started. 5. Any SX-28 or SX-28A that is ORIGINAL and DOES NOT have the standard serial number plate installed on the rear of the chassis - this is verification that ALL SX-28s, SX-28As and ALL various military versions were serialized at Hallicrafters. - This is important because we are estimating total production based on the assumption that all receivers had Hallicrafters' serial numbers assigned. 6. Any AN/GRR-2 receivers that were MFP date stamped at any other time period than May, 1944 - confirmation of one production run. 7. Any other interesting variations seen on original SX-28 or SX-28A receivers - hopefully will include serial number. 8. Any Hallicrafters inspection tag information - these are paper-wire tags that are attached by twisting the wire wrapper onto the power cord. These tags are dated and carry the assigned serial number. Additionally, there will be several inspector stamps or initials. Since all serial numbers were assigned sequentially, it doesn't have to be an SX-28 - ANY model Hallicrafters' tag provides important build-date information. 6. Peter W. Dahl Co. will supply a new audio output transformer for the SX-28 with the correct impedances and proper physical size. Click here to go to Peter W. Dahl Co. Peter Dahl company is now a subsidiary of Harbach Electronics LLC. Harbach bought the Peter Dahl name along with the transformer designs and design equipment. The orders placed with Harbach Electronics are then forwarded to MAGCAP Engineering for building of the transformer. The completed transformer is shipped to the customer from MAGCAP. NOTE: This information is somewhat dated. Check the Internet for current availability as Harbach has sold some of the transformer business in 2013. 7. Thanks to the literally hundreds of collectors that have sent in their SX-28/28A serial numbers, photos, comments and observations. Also, to those ham user/enthusiasts that have provided information by "on the air" conversations.